Combine quality and comfort, and a practical promotional company gift that can hold credit and debit cards, cash and coin. Even a passport. The uses are endless, and just to top it off, have your company brand name logo on its cover. 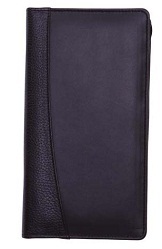 With a luxurious soft leather surface, smooth to the touch, the Capricorn Travel Wallet for Company Gift is the ultimate and most profound promotional gift. Ideal as a freebie or giveaway - why not post these to clients and customers? or give them out at business conventions and trade fairs.